In the workshop we started with a voting: participants were asked to vote for their two favorite topics. In a next step participants could discuss one of these topics at a round table for 15-20 minutes, then change to a second table with another topic. Some discussions were a follow up to presentations and talks during the conference. So there had been several presentations on the issue of making digital content visible to patrons. Also user experience and new approaches to management (radical change) was discussed in some presentations and keynotes. Libraries should start with better understanding their users needs and behaviour. They should be ready to rethink their services and focus on users needs. 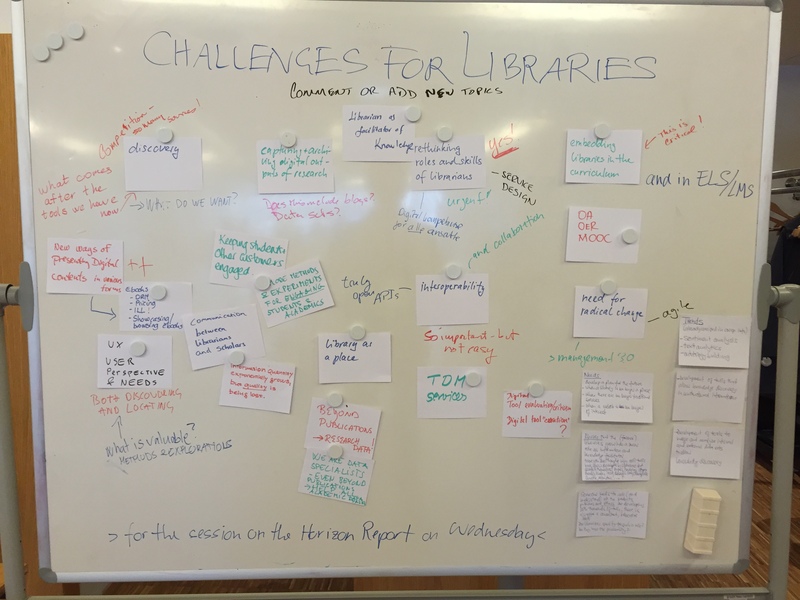 Patrons can and should be engaged in different ways: libraries become a marketplace and/or a lab. We talked about experimenting with and evaluation and providing tools to students – as it was shown by Adam Blackwood in his presentation. This was also discussed at the table on library as a place. 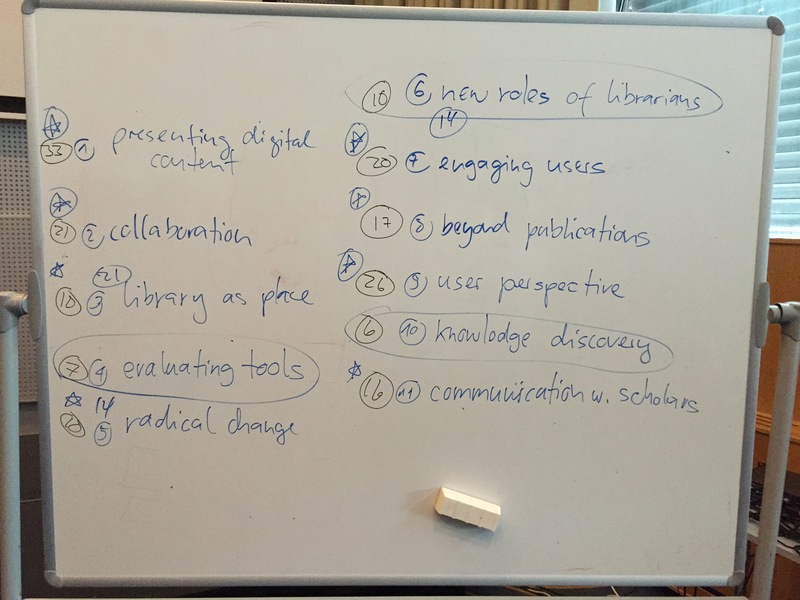 So many of these topics were somehow „intertwingled“ (see keynote speaker Peter Morville’s blog): new services based on user needs were connected to the library as a place, to the new roles of librarians and to the need for radical change. I added for example some thoughts on the need for radical change: I want to give here a short input from the conference #emtacl15: we heard several keynotes on new forms of management (agile, management 3.0, institutions as ecosystems and similar concepts). For me it was clear that most libraries are far away from these agile, dynamic forms of organization. They are mostly still hierarchical and linear. In this way they won’t be able to interact successfully with external partners (i.e. from research) that are organized in a different way. And they aren’t ready for radical change. You can’t find out a new business model if you are stuck to old structures and think in closed patterns. Daniel Forsman showed a positive example from Chalmers library: Oh, so we should change the way we work? (his prestentation on slideshare). 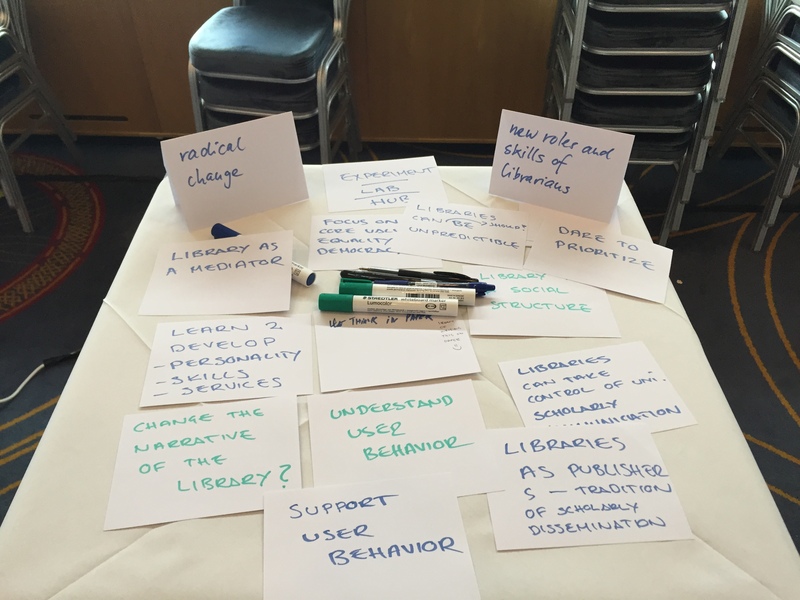 Again an input from the #emtacl15 conference: we talked a lot about user experience to be in the focus of library work. It starts with knowing what users really do and then to find out what they want and what they need. Observation methods give interesting insights into user behavior. Then users should be able to participate in the development of new services, i.e. in focus groups. And some speakers showed examples of how agile prototyping could be a way how to develop new services. And I would like to add another aspect: the need for engaging patrons. There are new concepts of participating patrons in the creation of new services. And another newer concept is connected to the makerspaces: libraries should give possibilities to explore new technologies and experimenting with them. So the library becomes a lab. 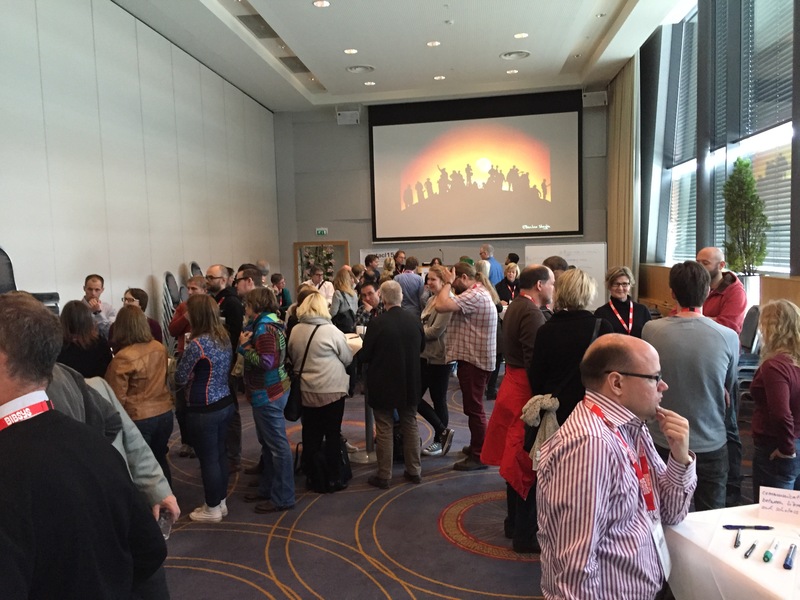 At #emtacl15 there were examples from University of Manchester Library’s DigiLab or from University of Oslo Library. 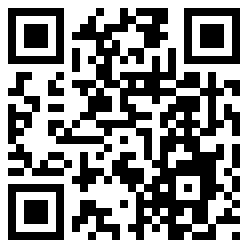 Most of the conference presentations are or will be available on the emtacl-homepage.